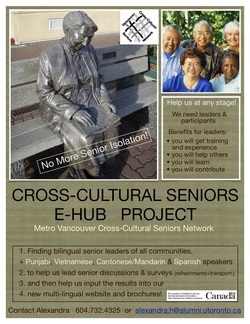 In 2013 the Metro Vancouver Cross-Cultural Seniors Network received federal funding from New Horizons for Seniors. This funding was for creating an E-Hub and Brochures in 5 languages with information and resources for seniors. The 5 languages are: English, Simplified Chinese, Vietnamese, Punjabi, and Spanish.